Carrot Halwa is a popular dessert of Punjab in India and also in Pakistan. Served as a dessert in all Indian Festivals especially Diwali, Holi and Eid and Raksh Bandan. Gajjar ka Halwa has introduced in Mughal period. 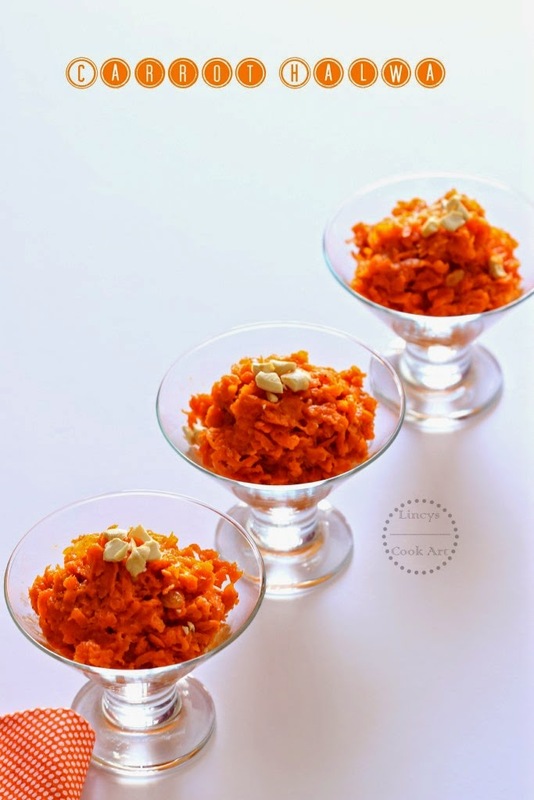 Carrot Halwa prepared with the combination of milk and carrots named as Milk Flavoured Gajar Ka Halwa. Same halwa prepared with Cream/ Mava (Khoya) is described as Mava flavoured carrot Halwa. Easy to prepare dessert in minutes with the ingredients already available in your pantry. Kids too love this dessert as it is tasty and also colourful. Perfect for all festive occasions. Wash and peel the carrots; Grate them and set aside. In a pan add milk and cook till it reduces approximately half on medium flame by continuous stirring. Add the grated carrots and cook in milk till soft. Add a tablespoon of ghee and sugar cook the carrots till soft and the moisture almost evaporates. Add the sugar, food colour few drops and cardamom powder and mix well. When the moisture almost totally evaporates add a tablespoon of ghee and cashews and raisins and mix well. It does not tastes similar to other halwa but it tastes similar to palkova/peda. Transfer the halwa inside a pan slightly coated with ghee. Flatten the surface with a backside of the spoon dipped in ghee. Cut in to pieces with knife. Chill the slices inside the fridge and remove the slices from tray and serve chilled. Notes: Saute the carrots in ghee and cook them in condensed milk and add nuts and raisins is another super easy method and it saves time.